This past Saturday, 6 June 2015, the 71st Anniversary of the Allied Invasion of Normandy, also known as D-Day, was held at The National D-Day Memorial. The annual commemoration ceremony honors the brave men and women who made the ultimate sacrifice for us on that fateful day of days. They encompass the many reasons why we are here today and why it is of utmost importance to never forget their sacrifice for generations to come. D-Day veterans Arden Earll and W.D. 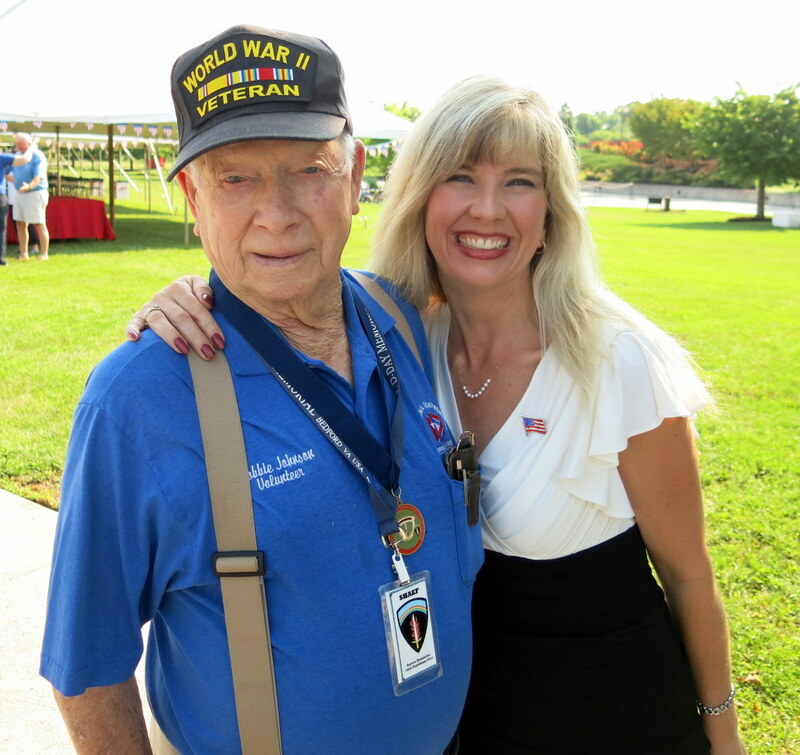 Casey with Korea Veteran Robert E. Key. 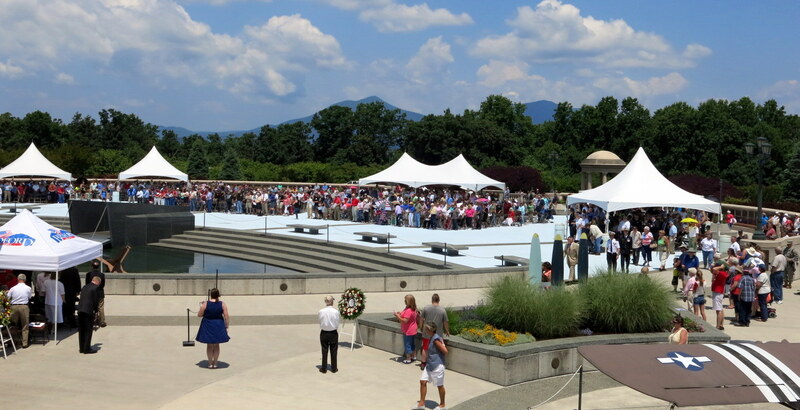 Over 1,900 people from across the world honored the Memorial with their presence for the 71st Anniversary of D-Day. 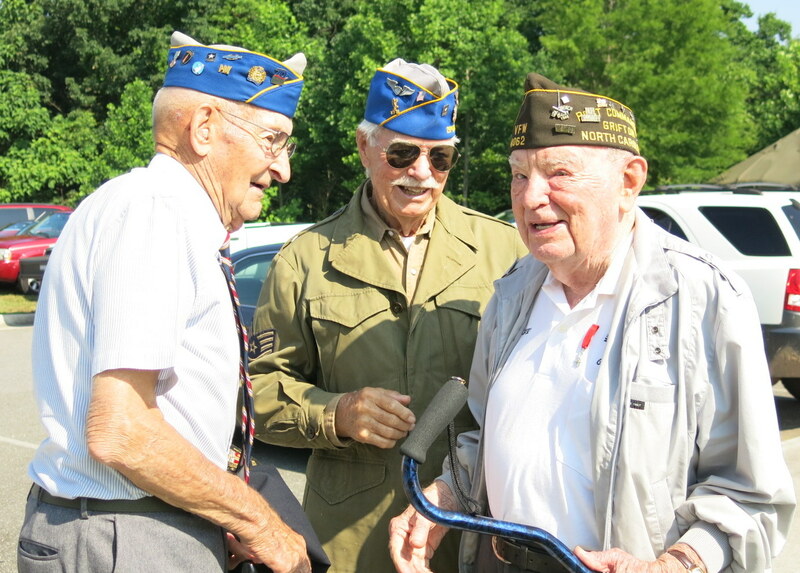 Among the audience were at least 50 D-Day and World War II veterans. It is a true blessing to be able to honor these men and women while they are still with us. The theme for the day was honor, fidelity, and sacrifice; not a soul uttered a word when the 29th Division began the drum roll and Attention, followed by the Presentation of the Colors. The wreath laying portion of the ceremony, in tribute to units involved in the D-Day invasion, was especially emotional to observe, along with the playing of Taps shortly afterwards. 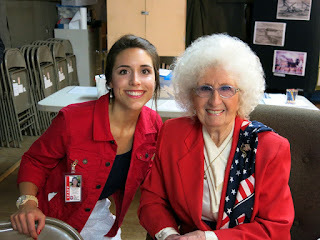 Dame Mary S. Barraco and I in the Education Tent. Keynote Speaker Dame Mary Sigillo Barraco brought the audience to tears with her stirring and inspiring speech on the subject of honoring the past and preserving fierce patriotism in the face of evil. Dame Mary Barraco was an American teenager living in Nazi occupied Belgium. At the tender age of 17, Mary made the courageous decision to join the “Freedom Fighters”, a Resistance Group known for aiding downed pilots, sneaking supplies and knowledge in and out of detention camps, and providing safe haven for Jewish citizens fleeing from Nazi persecution. Mary and her fiancé were eventually betrayed, for the equivalent of $15, by none other than a fellow Belgian partisan. Both were captured and separated by the Gestapo and were sent to a series of detainment camps. Mary’s fiancé was executed while she spent the remainder of her captivity in a Nazi controlled concentration camp. Mary was subjected to unimaginable horrors while imprisoned, yet despite it all, she continued to fight for liberty and freedom, drawing strength from God, justice, and love of country. 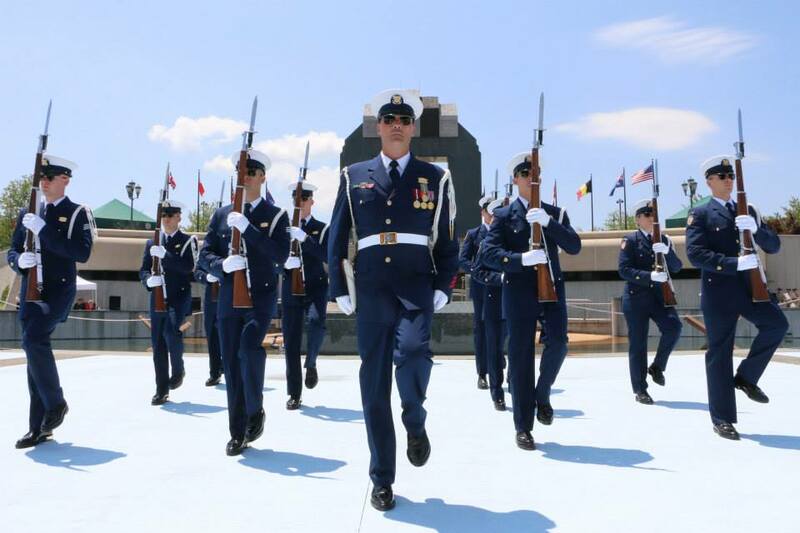 After Dame Mary’s moving speech, the Coast Guard Silent Drill team honored our D-Day veterans with a Tribute to Veteransperformance in the Main Plaza. Once again, the audience was completely silent and in awe of the talented group of men and women displaying phenomenal discipline as they swung their battle ready rifles with precise execution. Shortly after the conclusion of the ceremony, patrons were treated to the delightful talents of the 29th Division Band featuring guest conductor Colonel Arnald D. Gabriel, legendary conductor and World War II veteran. 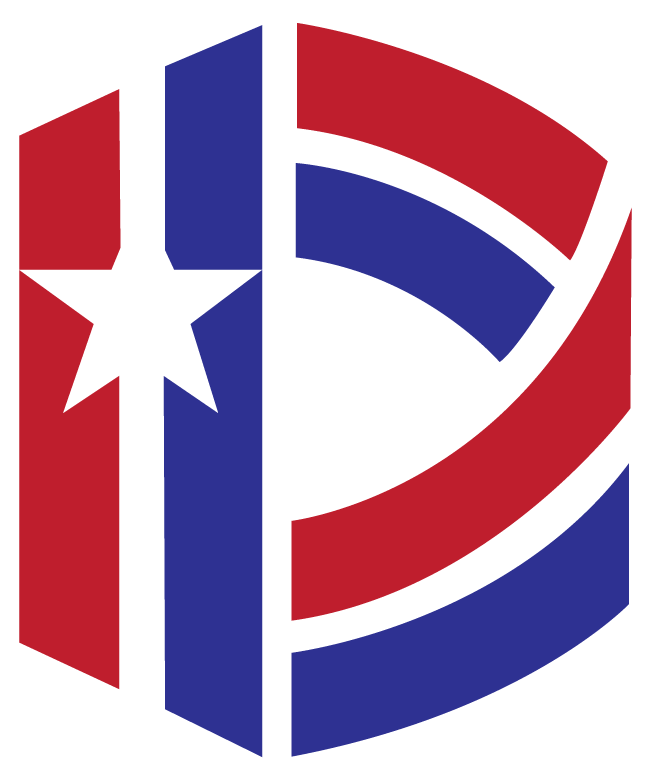 Col. Gabriel served as a machine gunner with the 29th Infantry Division in Europe during World War II, receiving two Bronze Star Medals, the Combat Infantryman’s Badge, and the French Croix de Guerre. 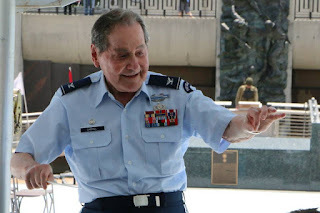 He continued his military career with 21 years dedicated to the United States Air Force, conducting the renowned U.S. Air Force Band, Symphony Orchestra, and the Singing Sergeants from 1964- 1985. Following his retirement, Col. Gabriel was awarded the Legion of Merit for his service to the U.S. Air Force and to music education. Woodmen of the World Lodge 175 D-Day cake. A highlight for so many each year is the Veterans Reunion Tent. 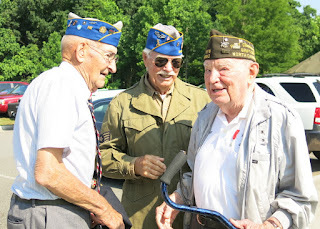 D-Day and World War II veterans are able to meet for the first time or visit with old friends as they and their families share memories of the past and hopes for the future. This year, the Reunion Tent had a special treat for our veterans and visitors. 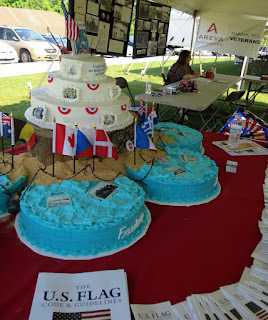 The Woodmen of the World, in celebration of their 125th anniversary, wanted to pay tribute to our D-Day veterans by baking a magnificent cake for their enjoyment. The cake showcased the twelve Allied nations that took part in the Normandy landings, along with all five invasion beaches represented around the cake. Warmest thanks to all who supported the National D-Day Memorial for our most special event of the year, the Anniversary of D-Day. AREVA, Financial Designs, Freedom Aviation, Winoa USA, and Woodmen of the World Lodge 175 were fundamental to the success of the 71st Anniversary of D-Day. On that same token, the event would not have been such a triumph without the help of our wonderful, hardworking, and dedicated volunteers! Thank you on behalf of all of us at the National D-Day Memorial.